Halloween is an exciting time for children. They get to dress up in their favorite costume and trick or treat for lots of loot. However, it is not such an exciting time for parents! Now that Halloween has come and gone, parents may be left wondering how to manage all the sugary treats that were collected…. If you are worried that the treats your kids will be eating will damage their teeth, here is a list of Halloween candy tips to help minimize the effects of all that candy on teeth.If you are worried that the treats your kids will be eating will damage their teeth, here is a list of Halloween candy tips to help minimize the effects of all that candy on teeth. Sort and Eliminate: After trick-or-treating, sit down with your kids and sort through the candy together. Most parents know that they should check for any candy that may have been tampered with, but they should also look at the type of candy their child received. 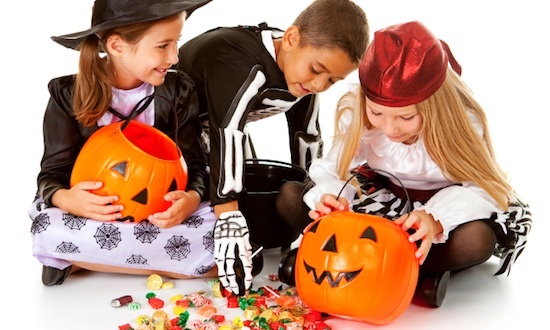 Sort the candy into piles – hard candy, soft sticky candy, and less harmful candy. Hard Candy — there are 2 ways to eat hard candy – both are a danger to teeth. Sucking on hard candies provides a long exposure to the sugars that nourish cavity-causing bacteria. Crunching on hard candy can break a tooth, damage orthodontic brackets and wires, and damage sealants. Soft and Sticky Candy – such as gummy bears, taffy, sticky caramels, fruit snacks etc., stick between teeth, in the grooves of the biting surfaces of teeth and around orthodontic brackets and wires, and provide bacteria with a nice long-term meal. Safer Candies – candies that are soft and non-sticky – things like chocolates, M&M’s, and peanut butter treats are the least harmful to teeth. Consider a “Buy Back” for offending candy. If the candy your child received sets off an alarm in your mind, consider offering a trade for such candy. Set a limit of 1 to 5 cents per piece of candy, and “buy back” the offending candy. Set Limits: Once you have sorted their candy, and narrowed it down, set rules for when and how much candy can be consumed. Schedule “candy time” once a day, preferably with snacks or meals, not in between. It is always best to eat sweets with other foods. The presence of the additional food increases the saliva production in the mouth. This increase in saliva helps to break down the sugar quickly, which in turn decreases the amount of acid produced in the mouth. Do not allow them to “snack” on the candy throughout the whole day because it provides a constant sugar attack on the teeth. 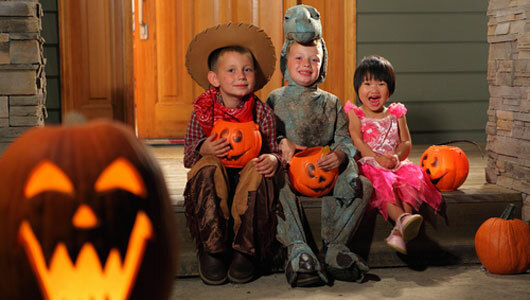 Brush and floss: After consuming Halloween candy – have your child brush and floss their teeth. You can also have them rinse with a mouthwash designed for kids that contains fluoride, which will help to prevent cavities. Chew Sugar-Free Gum: Sugar-free gum works just like food to increase the saliva production in the mouth. 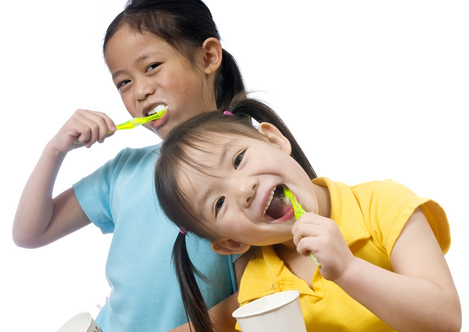 Offer your child a piece of sugar free gum if tooth brushing is not an option after eating the candy. When selecting a sugar-free gum, look for one that contains xylitol, for the added benefit it brings for post-candy consumption. There are also xylitol mints available if your child does not like gum. 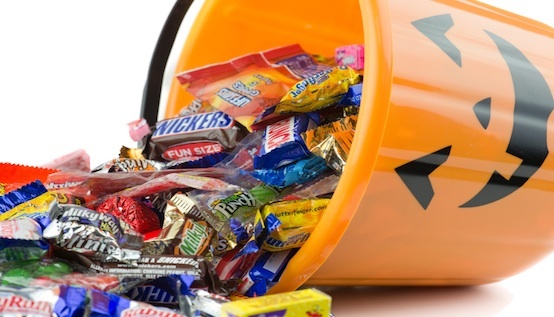 Set an expiration date: Impose a reasonable time limit to keep the Halloween candy in the house, then get rid of it! Set an example: Make sure you set an example for your kids with how you consume sweets during the day. If they see you practicing healthy snacking – they are more likely to get on board with it! This entry was posted in Cavity Fighting Strategies, It's Your Health, Oral Hygiene, Prevention. Bookmark the permalink.